The most attractive wedding invitation stamps were selected for this collection of floral wedding stamps. Grouped By flower below, the category Other Beautiful Flowers has several special Gerbera Daisy stamps and Lily Wedding Stamps has some beautiful Calla Lilly stamps. 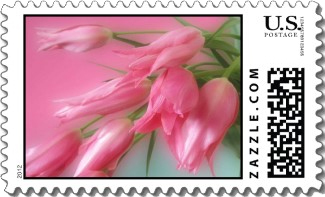 Or simply scroll to see the complete collection of floral postage stamps. Cream roses with a touch of pink and peach elegance fill the frame of this rose wedding stamp. Customize It! Easily add your text for Save the Date or any other use. "Inside" a classic long stemmed red rose. A rose wedding stamp that goes with any assortment of colors and styles. Red roses never go out of style. Customize It! Easily add your text. The soft brown background of this rose wedding stamp beautifully offsets the small red rose on the right. Personalize It! Easily put your names on the left. Very sweet and stylish. A lovely rose wedding stamp that goes from dark pink to light with the text "Our Wedding" in a complementary pink at the top. A lovely and romantic crisp white roses with a champagne flute in the foreground. Change the text as you wish. A classy white rose wedding stamp. Rustic and striking Save the Date rose wedding stamp with two hot pink roses in the handle of a weathered gray barn door. White "Save the Date" text at bottom. A sharp and vivid pink rose fills the window of this rose wedding postage stamp. Customize It! Easily add your text. A combination rose wedding stamp with sparkling silver wedding rings and a white rose. Beautiful silver text saying "Our Wedding". An elegant touch to compliment your wedding invitations. This rose wedding stamp has a single pastel pink rose offset by a bed of soft blue blue flowers in the background. Striking. Customize It! Easily add your text. Elegant springtime rose wedding stamp with a peach colored bow, topped with a dusty peach rose on a split black and light colored background. Customize It! Easily change the RSVP text o say what you want. A versatile and stylish wedding stamp. This yellow rose wedding stamp has the floral arrangement at the top with the text "Our Wedding" in a yellow banner. Bride and groom names at date at the bottom with a black background. All text is customizable. The soft pastel pink of this wedding rose stamp fits with any style or color of wedding invitation. Customize It! Easily add your text. A pink rose and white pearls reflecting on a wood table and the script "Join Us" subtly in the lower center. A very stylish rose wedding stamp. 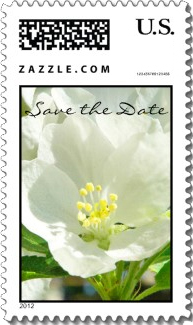 This sugary white wedding rose stamp includes a RSVP notice in the bottom right corner in a light gray. Classy and stylish. Soft and beautiful perfectly purple orchid wedding stamp. Personalize It! With your names and date. Coordinating wedding stationary also available. Picturesque potted white orchid contrasting against a black swirly background. Personalize It! 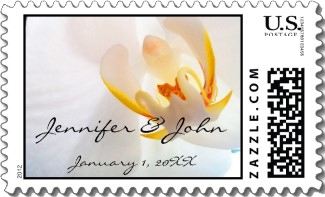 Add your names to the bottom center right of this stylish orchid wedding stamp. Unusual and elegant pastel green orchid fills the frame of the wedding postage stamp. Customize It! Easily add your text. A stunning bridal bouquet of pink and white orchids makes a stylish wedding stamp. All text in the lower right is your's to customize. Orchid wedding stamp has a close up inside the blushing pink flower. The text "Our Wedding" against a black banner at the bottom. Stylish. Beautiful white orchid stamp with green buds in the background. Coordinating colored text. Personalize It! Easily add your your names and wedding date or any text you like to this wedding stamp. Personalize It! The text on this burgundy, green, and white Cymbidium orchid wedding postage stamp is fully customizable. Matching stationary, stickers and more. Very stylish orchid wedding stamp with a close up of a white orchid. Personalize It! Easily add your names and date on the petal. Matching invitations and stationary available. Close up of a pair of burgundy and white multi-color orchids. Customize It! Easily change any text and use this orchid wedding stamp to coordinate the look of all your wedding correspondence. A wonderfully color coordinated design on this orchid wedding stamp. Deep pinks and vibrant whites. Superb. Vivid and colorful pair of love birds among wild jungle orchids. This orchid wedding stamp will work with nearly any color scheme. Customize It! Easily add your text. Beautiful white orchid with hints of yellow and orange in the center. Personalize It! Easily include your names and date on this wonderful orchid wedding stamp. Stylishly simple. White orchid on a black background. Customize It! The white text on this orchid wedding stamp can be anything, your names, Save the Date or make several versions for a coordinated look. Personalize It! Add your names and date to this elegant pink orchid and pearls wedding postage stamp and pair it with the matching cards, invitations or announcements to create a coordinated nuptial set. 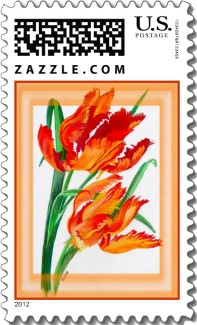 A wedding stamp with colorful tulips from around the world are not just for Spring. Beautiful enough for anytime of year. Customize It! Easily add your text. Soft colors of a yellow and pink tulip close up with green stem are the highlight of this fashionable tulip wedding stamp. Personalize It! Easily include your names and date. Beautiful bouquet of pink tulips. 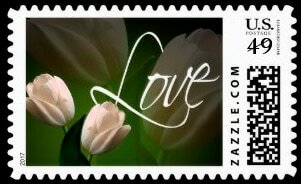 Very simple and elegant tulip wedding postage stamp. Customize It! Easily add your text. Pastel painting of yellow, pink and red tulips in a basket. A vintage look to this tulip wedding stamp. Customize It! Easily add your text. Sharp yellow tulips on this bridal wedding stamp are contrasted by a dark blue background. Personalize It! Text can easily be changed, so you can use this stamp for all your wedding mailings. A photograph of three tulips, yellow, white and purple, aligned in a row are featured on this Spring wedding stamp. A field of white tulips and their green leaves fill this tulip wedding stamp. Customize It! Easily add your text. A field of perfectly purple tulips on a field of green stems and leaves fill the frame of this wedding stamp. Customize It! Easily add your text. Vividly colorful bouquet of spring tulips in many colors and shapes fill the frame of this tulip wedding stamp. Customize It! Easily add your text. A field of vivid red tulips fill the background of this tulip wedding stamp with a single white and red tulip in the foreground. Customize It! Easily add your text. Lovely watercolor of salmon pink tulips to the left and your names and date on the right. A stylish tulip wedding stamp. An excellent illustration of a deep orange and yellow parrot tulip. An orange and cream border surround these flowers on this attractive wedding stamp. Close up of a white tulip contrasted with a plant green background works well with the white text on this tulip wedding stamp. Personalize It! Easily add your text. Personalize It! Change the text on this up close photograph of perfectly pink tulips. Tie together your Save the Date, Invitations and Thank You cards with this one image. Quite beautiful. Two peach colored tulips to the left repeated as a shadowy background. The text "Love" in a lovely script font. An elegant wedding stamp. Extraordinary Calla Lilies with varying shades of purple and yellow, softened around the edges with a violet border. Truly beautiful calla lily wedding stamp. Beautiful orange lily with pink daisies just barely in the frame. Lovely colors on this lily wedding stamp. Customize It! Easily add your text. A striking rendering of purple calla lilies showing their orange interior and green stems. A subtle violet and blue striped background completes this lily wedding stamp. A bouquet of Stargazer Lily blossoms in a striking pink with yellow centers. The greenery in the background helps offset the vibrant colors of this lily wedding stamp. A realistic rendering of three white calla lilies with soft greens and pinks. A green swirling background completes this beautiful lily wedding stamp. Customize It! Easily add your text. This lily wedding stamp presents a lovely bouquet of cream Calla lilies with the golden script "Love" in the bottom right corner. A lily wedding stamp of a photograph of white calla lilies and a green leaf resting upon soft white lace. Personalize It! Easily change to your wedding date and names. An orange, gold and brown tiger lily with October Wedding in a cream font. Wonderful wedding stamp choice for your Fall wedding. Dramatic white calla lily against a dark background with bride and groom's name in script font. Very stylish lily wedding stamp. Beautifull and elegant calla lilies in shades of purple and pink. Personalize It! Easily include your names and date. Visually striking, this beautiful pink calla lily wedding stamp has a black background with the swirly pink text "Love" in the lower right. Beautiful bouquet of white wedding lilies and their greenery fill the frame of this wedding stamp. This close up of the interior of a pink tiger lily shows hints of orange and yellow. A wonderful combination of colors on this lovely lily wedding stamp. Beautiful white lily wedding stamp with a close in photograph shown the soft green and yellow stamens. Simply delightful. Customize It! Easily add your text. Simple, pretty, and cheerful. Personalize It! Easily make this Pink Gerbera Daisy wedding stamp yours with your name and date. Matching wedding stationary is also available. Soft pink with hints of blue tipped petals are beautiful colors for this peony wedding stamp. Customize It! Easily add your text. A classy wedding stamp with a black background, subtle swirling scrolls, and a bright pink gerber daisy. Personalize It! Easily exchange your names in the white text. A wonderful rendering of a cream colored magnolia blossom in subdued greens and browns. A hard to find flower on a wedding stamp. Personalize It! All of the text on this chalkboard watercolor anemones can be customized. A striking floral wedding stamp. A strikingly brilliant pink gerbera daisy fills the frame of this beautiful floral wedding stamp. Customize It! Easily add your text. This African daisy rose has a unique combination of colors with pinks, blues and yellows. A striking wedding stamp. Stylish and elegant, this Save the Date wedding stamp has a sugar white spider mum against a black background and subtle text in the upper left. Intense close up of a lovely lavender Iris with its yellow interior and "Love" at the bottom right in a swirly font. A wonderful color combination on this wedding stamp. A beautiful rendering of two red "Heart Flowers" make up this compelling love wedding stamp. Attractive and simple. An arrangement of many different fall colors flowers fill the frame of this Autumn wedding stamp. A colorful collection of soft orange hibiscus set off by swirly greenery make a lovely wedding stamp for any time of year. Personalized with your initials. Personalize It! Easily revise the vanilla colored text on this fall wedding stamp. Deep rich red and golden autumn flowers. Personalize It! It is easy to change the text on this colorful flower tree wedding stamp to provide a coordinated look for all your wedding correspondence. This orange bird of paradise wedding stamp would be the perfect accent to any tropical or beach themed wedding invitation or announcement. Personalize It! Easily change the text on this wonderfully white apple blossom wedding stamp to coordinate all your wedding correspondence. The most attractive wedding invitation stamps were selected for this collection of floral stamps. Grouped by flower type, the category Other Beautiful Flowers has several special Gerbera Daisy stamps and Lily Wedding Stamps has some beautiful Calla Lily stamps. 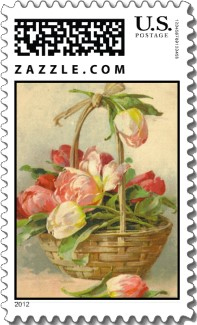 Or simply scroll to see the complete collection of floral postage stamps.